It is my humble opinion that my struggle with ME/CFS - whatever triggered my illness - devolved into chronic Ion Channelopathy - a milder form than usually diagnosed but dibilitating enough to effect daily functioning. 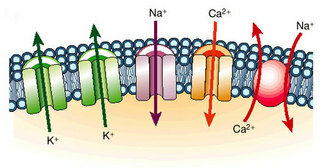 The diagram below shows ion channels in the cell membrane which enable ions to pass into and out of the cell. I wanted to share some new insights into ME/CFS that we discovered during the winter of 2009. I had experienced a series of colds layered over a stubborn sinus infection which dragged me down for a few months. At first, I thought it was just an unlucky string of viruses but then I began to recognize the old CFS syndrome that I suffered with in the mid nineties. I spent a week in denial before I admitted that this was a recurrence. It was the same “sick” feeling that I never did find the right words to describe. Of course this time, it was just the beginning of something that was far from the totally debilitating illness that I had before. I immediately started following the eight step protocol. And I must honestly admit that I had been breaking many of the rules for a long time and getting away with it. I had been short changing my sleep needs, ignoring my energy levels by pushing too much, neglecting to take simple basic daily supplements and forgetting to maintain the most rudimentary aspects of reasonable self-care. Ok, so I’m human. After a couple of focused weeks on the protocol, I was significantly improved. But I still had a degree of that “sick” feeling that I couldn’t shake off. As part of the protocol, I had been drinking plenty of water and taking a sodium supplement to support an optimal blood pressure. So I decided to add a 12 oz can of vegetable juice (tomato based - not low sodium) in the afternoon as a pick me up to see if that could help me get some energy through the rest of the day. I continued to follow the rest of the protocol and in a week I was feeling significantly improved. After a month, I was feeling great and the “sick” feeling was gone. My husband, John the biochemist, asked me if I had ever looked into ion channelopathy as part of my original research. The answer was no. I decided to start by reading up on the known diseases that are associated with ion channelopathy. And here’s where the disclaimer comes – I am not a scientist nor do I pretend to understand the intricacies and interdependencies of the human body’s biochemical pathways. Any ideas that I put forth are those of a lay person. But I do believe that sometimes scientists benefit from someone who steps back from the bark and takes a good survey of the entire forest. As understood by a non-scientist, ion channelopathy is a malfunction of the ion channels of the cellular membrane. These channels allow for the successful passage of ions into and out of the cell. These ions are prominent components of the nervous system and support rapid changes in cells, such as cardiac, skeletal and smooth musclecontraction, and epithelial transport of nutrients and ions. Most ion channelopathies are diagnosed in infancy due to the severity of malfunction. Some are known to have adult onsets. From a non scientist’s perspective, the known diseases of ion channelopathy include migraines, epilepsy and two categories of muscle malfunction. The first presents as severe muscle pain and paralysis which is relieved by movement and simple exercise. The second presents as severe exhaustion and muscle stiffness which is worsened with exercise. The parallels between fibromyalgia and CFS were striking to this non scientist. The symptoms of known ion channelopathies include muscle weakness, muscle stiffness and paralysis, muscle discoordination and pain, abnormal cardiac rhythms, sleep disorder and memory loss. Sound familiar? Could there be milder forms of these more debilitating diseases? The specific ions involved with these malfunctions are sodium, calcium, chloride and potassium. The presentation of a specific disease is dependent on which channels malfunction and can involve just one ion or any combination of two or more. Ion levels can be too low, too high, not in the correct ratios, present in the blood stream but not in the cell and vice versa. I immediately checked out the label on a 12 oz. can of vegetable juice. As expected, there was almost 700 mg of sodium in the form of sodium chloride – common table salt. Unknown to me, there was also an equal amount of potassium. It also contained some calcium (which for me is supported by a daily supplement and a diet containing skim milk, cheese and yogurt). Essentially, I was drinking a high dose ion cocktail which could be readily absorbed into the bloodstream. My reasons for drinking vegetable juice during my first, debilitating bout with CFS, were to increase my blood volume there by increasing my low blood pressure. And I also believed that I was suffering from a long term lack of sodium in my diet. I corrected this by drinking several glasses of water a day, taking a salt tablet once a day and drinking a can of vegetable juice once a day. This was done under the supervision of a physician to ensure that I didn’t develop high blood pressure. At that time potassium and chloride were not part of an intentional treatment as they were not being considered. During the past winter, I didn’t add vegetable juice at first as I felt that I had been getting enough sodium in my diet of late. I only added it when I thought my blood volumes might be dropping, later in the day. Are ion channelopathies part of the CFS equation? If you search the web for both, you will get several hits from researchers who are investigating a possible connection. Could I have corrected an ion channelopathy by drinking a high dose ion cocktail once a day? Could this have given the body’s natural regulatory pathways an opportunity to reset to normal over time? Are there downsides to such a treatment which would require monitoring other than high blood pressure? I found no definitive answers for now. My only contribution is an anecdotal case study of one. And CFS being a wastebasket diagnosis, I offer this that it may be helpful to some.